The iON from Wiggle's in-house brand, dhb is aimed at the entry level end of the category. At £40 you'd still expect to get a decent lid but perhaps without all the bells and whistles. This helmet is designed to do it all at the entry level pricing. Helmets can have something of a Marmite effect on their wearers or admirers. Ultimately for the wearer it is about comfort, styling and in a worst case scenario, safety. The sign of a good helmet is when you're wearing it you forget it's there and the ventilation does its job, although during these cooler climes that's a moot point. 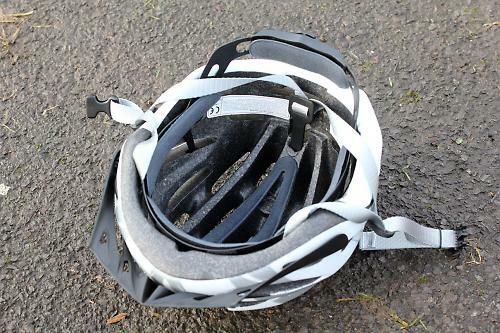 To enable helmets to achieve the 'I'm not really here effect' they need to be light but retain a tough construction. The iON is made using an in-mould process which fuses a robust polycarbonate outer shell with the impact-absorbing foam liner. The reason for helmets being made in this way is that it allows dhb to sculpt better ventilation systems thus making the finished products lighter and cooler than traditional versions. The first point, the weight. It certainly feels light but the claimed weight for the medium version I tested is still 340g. Not a behemoth but not as light as some of the competition. The ventilation aspect is achieved through 24 vents that are narrow but effective. However once on the iON does the trick of providing a nice, snug fit. Adjustments can be made to the fit using the ratchet wheel at the back of the helmet. It isn't the most advanced system you will find but it does the job. Inside, you have less padding than on some models but it is in the right places, on the crown and around the forehead area of the helmet. The pads are removable so can be washed. These proved to be surprisingly comfortable. There is a removable visor, but taking it off does leave two attachment points on either side which will perhaps not appeal to everyone. The white/silver finish is nicely done. The polycarbonate outer shell provides a smooth matt look which cleans well. Another impressive feature is the chin strap. It is easy to adjust and can be opened or closed while wearing full finger gloves. It comes with what dhb call a cam-lock, which is basically a clasp that allows you to easily adjust the length of the strap and then lock it place. Simple but effective so far. The only slight disappointment is the strap divider at the back of the helmet. In a lot of helmets the strap is integral to the body at the back. In the iON it is kept in place by a piece of plastic that can be felt on the back of the head. Given the right size the helmet will offer plenty of comfort and value. The iON is deemed suitable for both road and mountain bike use. Overall you get a decent helmet that looks good and does the job. An inexpensive helmet that offers style and comfort. Anyone who is looking for an inexpensive helmet and wants something that offers style and comfort. Helmets at this price point aren't going to have too many extras but you would expect them to cover all the basics. The iON does this. The iON is made using an in-mold process which fuses a robust polycarbonate outer shell with the impact-absorbing foam liner. The reason for their helmets being made in this way allows dhb to sculpt better ventilation systems thus making the finished products lighter and cooler than traditional versions. The iON provides enough ventilation to keep you cool with a couple of other features that you'd expect. The visor is removable but when you do it leaves a couple of slots on the side where it connects that look a little on the cheap side. The construction for the money is proving to be hard wearing and solid. At 340g it isn't the lightest helmet but it does the job. The helmet has an adjustable ratchet at the back to makes it easier to a decent fit. The only downside is the strap connector on the back of the helmet that digs into the back of your head. Considering the iON costs £40 you get a reasonable amount of equipment for your money although there are a couple of flaws that ultimately let it down. Overall the iON does what you'd expect it to but it comes up a little short in terms of total performance and comfort. The white/silver finish is nicely done. The polycarbonate outer shell provides a smooth matt look which cleans well. Another impressive feature is the chin strap. It is easy to adjust and can be opened or closed whilst wearing full finger gloves. It comes with what dhb call a cam-lock. Basically a clasp that allows you to easily adjust the length of the strap and then lock it place. Despite trying to implement some additional features some of them don't quite work. Did you enjoy using the product? I did although with some reservations. Would you consider buying the product? It wouldn't be my first choice. Would you recommend the product to a friend? If they had budgetary constraints then yes I would. You get a reasonable product for the money but if you are looking for something that offers plenty of features at this price point you will be disappointed. Is it Snell approved or the lesser EN standard or what? I'd like helmet reviews to cover this basic point. Snell is American isn't it? Why would Wiggle pay for Snell testing? Snell is much stricter, though it would never be or, you can't sell one in rather EU if it isn't declared and marked as compliant with the Euronorm. The Snell Memorial Foundation is based in the US, but most US helmets now use the CPSC that is weaker, inspired by catching up (chasing down?) to the weaker Euro Norm. As I understand it, the main difference is that Snell includes hitting a rock shape, as well as a kerb and a flat road. So why are will allowing ourselves to be fobbed off with lower standards? It's our heads inside the things! 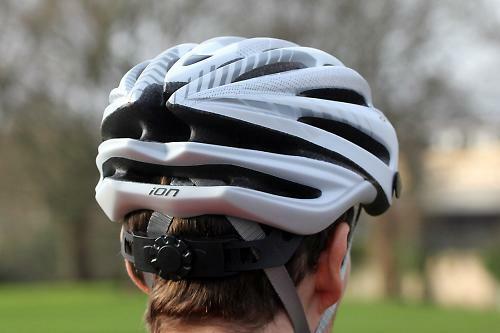 I recall reading that Snell certification also requires the helmet to be relatively smooth surfaced and free of protruding bits, which discounts many of the current crop of over styled roadie helmets.